If you only see one movie this year, you need to get out more. That being said, La La Land is the picture to catch. This nostalgic homage to the Golden Age of Hollywood is a panoramic masterpiece which makes very effective use of every inch of the big screen. Written and directed by Oscar-nominee Damien Chazelle (for Whiplash), the picture was shot in CinemaScope, a supposedly-obsolete technology that fell out of favor with filmmakers in the late Sixties. Here, Chazelle resurrects the wide-angled lens for a last hurrah in service of an old-fashioned musical unfolding against a breathtaking array of L.A. backdrops. La La also features an enchanting original score composed by Justin Hurwitz who collaborated with college classmate Damien on Whiplash as well as his debut offering, the deceptively-unassuming Guy and Madeline on a Park Bench. 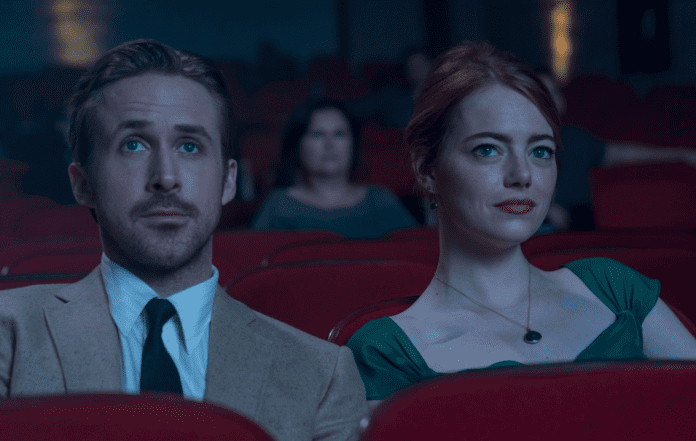 This relatively-ambitious romantic romp revolves around Sebastian Wilder and Mia Dolan, struggling artists played to perfection by Ryan Gosling and Emma Stone, respectively. Their talented supporting cast includes J.K. Simmons, John Legend and Rosemarie DeWitt. After a show stopping opening staged on a gridlocked freeway where stuck motorists suddenly break into song and dance, we’re introduced to the likable leads. We learn that jazz pianist Sebastian’s a purist playing for tips in dingy dives while trying to save enough cash to open his own nightclub. Mia’s an aspiring actress who divides her time between fruitless auditions and a thankless job as a barista at a coffee shop right on the Warner Brothers lot. Seb and Mia are strangers who initially experience only aggravation whenever their paths serendipitously cross. Eventually, sparks do finally fly, which inspires them to belt out mellifluous and melancholy tunes. More importantly, they fall in love and encourage each other to pursue their elusive dreams. Since it would be unfair to spoil any of the ensuing plot developments, suffice to say that Gosling and Stone are pure delight, whether warbling or just generating screen chemistry. A charming crowd-pleaser that richly deserves all the superlatives it’s undoubtedly about to receive over the course of the upcoming awards season! Previous articlePut the Pressure On!! !